Most of us are used to turning on a tap and water coming out. We rarely question whether this will happen or whether the water is clean enough to bathe in or drink. Though the process of maintaining water quality is practically invisible to most of us, removing bacteria and contaminants from water requires a lot of effort from both humans and treatment systems alike. Mohammad Alizadeh Fard, a doctoral student in Michigan Tech's Civil and Environmental Engineering Department, and Brian Barkdoll, professor of civil and environmental engineering, are developing low-tech, affordable solutions to improve water quality in municipal water tanks and to remove micropollutants from water using renewable materials. 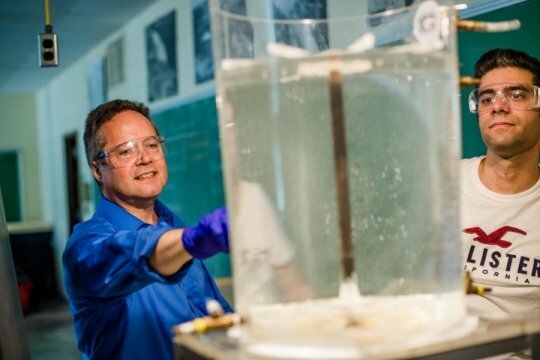 Their research has been published in three journals -- Journal of Hydraulic Engineering, Journal of Molecular Liquids, and Colloids and Surfaces A -- with a fourth paper pending review. Their work proves that solutions to vexing problems can be elegant in their simplicity. In communities around the nation, there are large water-storage tanks for municipal drinking use. Many such tanks have a line in to supply the tank with water, and a line out. However, these lines in and out are frequently at the tank bottom. Though the tanks are refilled daily, the water at the top of the tank is never used and becomes stagnant. Even though many municipal water supplies are treated with chlorine, the top water layer can become a breeding ground for bacteria, algae or waterborne illness, such as giardia and E. coli. "If the water is not moving, (bacteria and algae) can start growing," Barkdoll says. "It may not be originally from the water source; it could be from the air. Or the chlorine in the stagnant water could be used up after some time. You want the water to keep moving, especially in hot regions of the country." But if there's a large fire in the community or surrounding countryside, the water tank is drawn down significantly, and people then drink the stagnant water. "So, when you have a fire, all the stagnant water goes out to everybody's house," Barkdoll says. "After a fire, people get sick, that's a known thing. That's the problem that we're trying to fix." To remedy the problem, Alizadeh Fard and Barkdoll created shower head-like attachments that can be added to new or existing water tanks for minimal cost. Adding a PVC-pipe sprinkler at the top of the tank, and a reverse sprinkler at the bottom of the tank injects water into the system and keeps all the water circulating. Alizadeh Fard and Barkdoll published their article on this simple but effective system in the Journal of Hydraulic Engineering March 15. They hope it will be a low-tech solution easy for water quality managers to adopt.